Summary: Vintage furniture is beautiful and is perfect for a deck or patio. However, vintage furniture does require maintenance. Sand and paint any chips in the paint and make sure to store or cover them during periods of bad weather. If any of your furniture has a chip, it is only a matter time before it starts to rust. It is important to maintain your tables and chairs before it gets rusty. Use a sandpaper (about 120 grits) and smoothen down the area of the chip. Then paint over the area with an enamel paint. This simple task will make your furniture last a lot longer. Exposure to the elements can ruin your vintage furniture. If you live in an area that gets cold and damp for decent stretches of time, then store your furniture away. If you find that you don’t use the outdoor area because of the weather, then store them for that period. 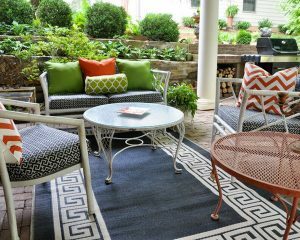 A lot of people won’t have the space to put all their outdoor furniture away for long periods. In that case, buy weatherproof covers. Written by The Foam Factory, specialists in foam sofa seat cushions and other foam products.